For the movie Harry Potter and the Prisoner of Azkaban, Glencoe was the setting for some of the filming which took place in 2003. Looking down on the Torren Lochan just along the road from the Strath Lodge and across to Signal Rock and the surrounding peaks, Hagrids hut, the gatehouse and sundial were all established as temporary sets. 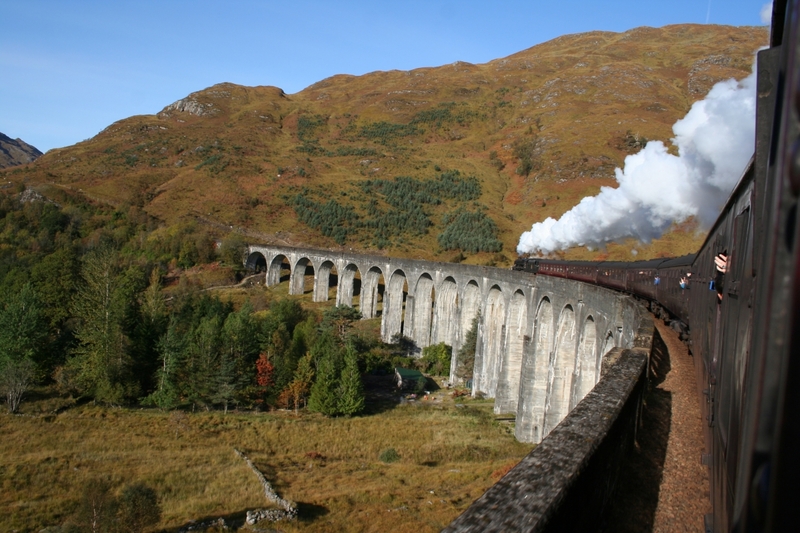 In addition, the spectacular viaduct in Glenfinnan on the railway line from Fort William to Mallaig also featured in the series of films. And if you’re heading that way, then we can point you in the direction of the final resting place of Dumbledore on the small wooded island in Loch Eilt. Relive that scene in the James Bond Skyfall movie by putting on your best suit and take a drive down Glen Etive in your Aston Martin – or, if owning an Aston is waiting for that lottery win, then any old car with 4 wheels will do. Monty Python and the Holy Grail used the Glencoe area in some of its iconic scenes. The Bridge of Death was filmed just up the road in the Glen and the ‘Castle of Aaargh’, the island castle where the Grail supposedly resides is in fact the nearby Castle Stalker.